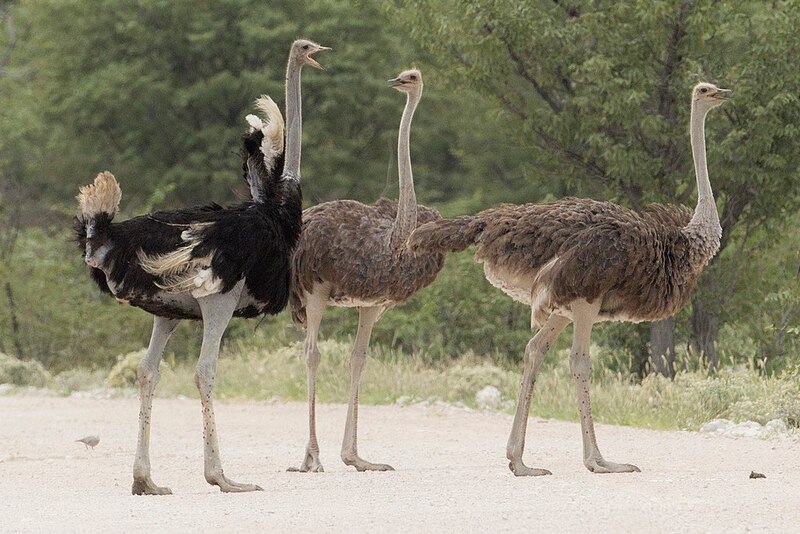 The largest bird in the known universe, the Common Ostrich belongs to a group of flightless running birds called ratites, which also includes kiwis, emus, rheas, and cassowaries. Because ratites don’t use their wings, their pectoral muscles are small and they have no need for their sternum to be keeled, an adaptation flying birds have to anchor their powerful, large pectoral muscles. Penguins can’t fly, but they do have powerful pectoral muscles and a keel, because they use their tiny wings underwater to propel themselves while swimming. So penguins are not considered ratites. Ostriches, like many desert-dwelling humans, are nomadic. In winter they wander alone or in pairs; during the breeding season in groups of 5 to 50 birds. Females join a group of 2–7 hens called a harem. One male scrapes a hole in the ground that will serve for the nest for all the females. He mates with and provides protection for them all. Sand-colored females incubate the nest by day; the male, black as night, incubates all night. The three-pound eggs are the largest of all living birds, and yet the smallest of all living birds in comparison to the female’s weight. Incubation lasts 35–45 days; with the high rate of predation, fewer than 10 percent of nests survive for the young to hatch. The male and females raise the young cooperatively; the male provides protection and also teaches the chicks to feed. Ostriches protect their young aggressively; they’ve been known to fight off lions in defense of chicks. Ostriches were once considered a single species. What had been considered a subspecies found in the Horn of Africa (that is Somalia, extending into southeastern Ethiopia and northeastern Kenya), was split from the rest of the species in 2014, due to ecological differences and evidence that they don’t interbreed; this is when what was simply called the Ostrich was split into the Common Ostrich and the Somali Ostrich. Due to political upheavals and unrest in Somalia, leading to widespread hunger, lawlessness, and lack of wildlife conservation enforcement, the once common Somali Ostrich is declining rapidly.